The fifth Asian Indoor and Martial Arts Games were held in Turkmenistan’s capital Ashgabat from September 17 to 27, 2017. Ashgabat were named hosts of the Games in Kuwait in December 2010. In addition to 45 National Olympic Committees (NOCs) of the Olympic Council of Asia (OCA), 17 NOCs from Oceania were allowed to participate at the Games, including Australia and New Zealand. 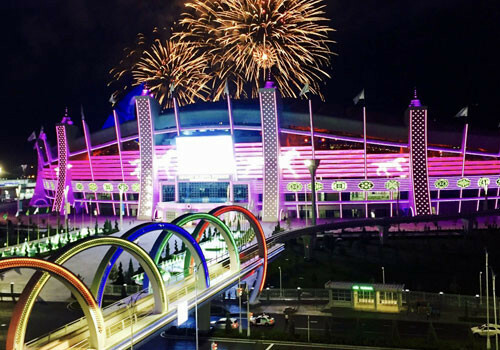 All competition at the Games took place in the newly-constructed Ashgabat Olympic Complex, which includes more than 30 different sites and an Athletes’ Village. Sports such as indoor athletics, track cycling and short course swimming featured on the programme along with the likes of chess, kurash, muay thai and sambo. The Ashgabat Olympic Complex hosted 11 days of competition in its state-of-the-art venues. It includes a main indoor arena with a capacity of 15,000, a velodrome that can hold 6,000 people and even a polyclinic. The overall cost of the Ashgabat Olympic Complex totalled around $5 billion (£4 billion/€4.4 billon) with construction carried out by Turkish company Polimeks. Aside from the Complex, the hosts also built cafes, a car park, consumer services, hotels, restaurants and shopping centres to ensure a first-class experience for both athletes and fans. The Athletes’ Village comprises of 12 to 14-floor buildings which include a total of 1,276 apartments with a total capacity of almost 6,000. The luxury Sport Hotel was also built in readiness for the Games, made up of 398 upscale guest rooms. It hosted up to 800 VIP guests from numerous countries during the event. Officials in Turkmenistan believe that the Ashgabat Olympic Complex could help the country secure events as prestigious as the Asian Games. In November 2018, it played host to the World Weightlifting Championships in the 5,000-capacity Martial Arts Arena. Two months prior to that, it was announced that the velodrome would stage the 2021 Track Cycling World Championships. Legacy: The Games left a legacy for sport and mega-event delivery in Turkmenistan. A total of 450 local staff were trained through the Ashgabat 2017 Games Academy, while 8,000 volunteers were primed to run and operate the Games, leaving a human legacy.